Their reaction epitomizes Seward County baseball. After winning the Jayhawk West title with an 11-5 win over Pratt Saturday at Stanion Field. They shook each other’s hands just like they did February 12 when Seward won their first game of the year over Northeastern Colorado. JUCO Hall of Famer Galen McSpadden says there is a reason Seward wins and wins and wins. "You just try to be consistent," the 30th year head coach said. "We’ve been fortunate to be on top for a while. We don’t want to step backwards. We always challenge our kids and tell them the guys who played before you set the bar. The least you can do is hop over that bar. If there’s any fight and competitiveness in you, you will raise that bar. These kids have done a good job." They didn’t do a good job in game on Saturday at Pratt losing 4-0, but they won game two 11-5 to clinch the West. In game one, Seward out hit the Beavers 9-5 but spoiled a solid complete game effort by Paul Pulley (5-3). Seward assistant Mike Davidson delivered a speech to the team in between games, and it eventually seemed to work, although not initially. Pratt led 3-0 and Seward had to pull starter Keegan Hucul on the fourth. But Seward’s bats came alive with three in the third and five in the fourth. Seward tacked on three in the seventh. Steven Polito was 2-5 with three RBI’s all coming with two outs. Moscow’s Jace Moore was a key to the win. Seward led 8-3 in the fourth, but the Beavers playing in their final home game loaded the bases with no outs before Moore entered the game and didn’t allow a run to score. 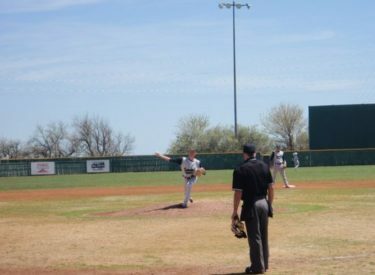 Logan Hall pitched four scoreless innings for his second save one day after a complete game win. He only threw about 60 pitches in a win on Friday allowing McSpadden to bring him out of the bullpen for the clincher. Seward will host the sub regional with the number eight and four teams from the Jayhawk East along with the number five team from the west coming to Liberal May 7-8 for the four team double elimination tournament. Seward is 37-18 overall and has won 15 of the last 18 games. They finish 24-8 in the Jayhawk West like last year’s team. Pratt is 21-29 overall and 6-22 in the conference.